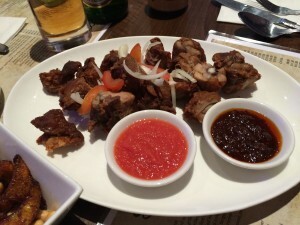 For our most recent Alphabet Adventure, the girls and decided to be brave and truly adventurous and try a cuisine which was unfamiliar to us all – Ghanaian food. We invited our honorary member Jane (who last joined us in Denmark) and booked a table at Sweet Handz in Holloway Road, North London. The restaurant was quite empty when we arrived and we were shown to our table by having it pointed out to us on a security camera, which I’ll be honest wasn’t quite what we were expecting. 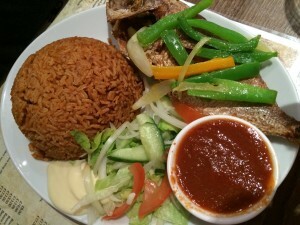 However, we were made very welcome by the lady who served us (who we reckon might have been the owner), and when we explained that we had never eaten Ghanaian food she enthusiastically recommended some dishes to us. The menu offered by Sweet Handz is huge, and seemed to us to be authentically Ghanaian. I have to confess that we did have a little giggle at the names of some of the dishes (palava sauce and fufu were two childishly amusing favourites from the night), but the lovely lady who served us kindly explained all the dishes and basically ordered for us from some of her favourites to start. As Jo and I are not huge fans of offal and innards, neither of us were looking forward to our starter of gizzards and turkey tail. 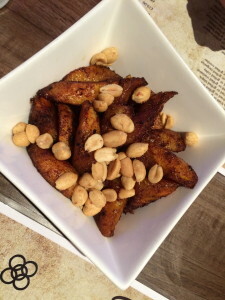 However our bowl of spiced fried plantain – kelewele – arrived first (decorated with roasted peanuts) and we tucked into it with relish. The gizzards were okay- very firmly textured and a bit chewy but not unpleasant if you firmly refused to imagine what in fact a gizzard is (or at least if you are squeamish like us – Andrew has eaten gizzards in salads in France many times and thinks they are delicious … but then he’ll also eat lamb’s tongue and kidneys so what does he know?). The turkey tail (tsofi) was a tad more challenging. Again, we decided not to google exactly what a turkey tail is (I mean, I don’t like birds but to my knowledge turkeys don’t have tails as such, and I didn’t really want to think about eating something that comes from too close to the bottom area …), and were presented with a plate of bony dark meat which was quite tough, chewy and gristly, albeit flavourful. The turkey tail arrived with two dips, one of which was extremely fiery (even though we’d been given the mild versions! ), and so I stayed away from them both although Jo bravely tucked in. Because the owner was so friendly we didn’t want to disappoint her by not eating everything on our plates, but it was a struggle to get through all of the dishes. Our minds were playing games with us and the textures were not what we were used to and so it’s fair to say that we didn’t tuck in with our usual relish. 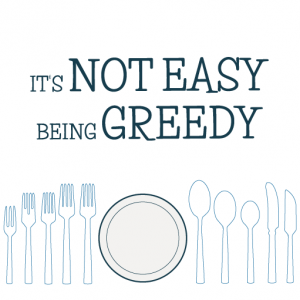 We felt even more guilty when our main courses arrived. 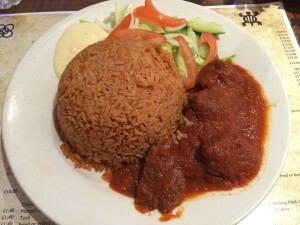 I was relieved to see I had picked very well: mutton stew with jollof, a rice cooked in meat stock which is yellow and tasty. The stew was delicious: full of flavour with a thick meaty sauce, and the mutton was tender from being slow cooked. It was served with salad (and salad cream!) and I am not a huge fan of salad with hot food so I left that but ate the rest, although the huge portion of rice defeated me. 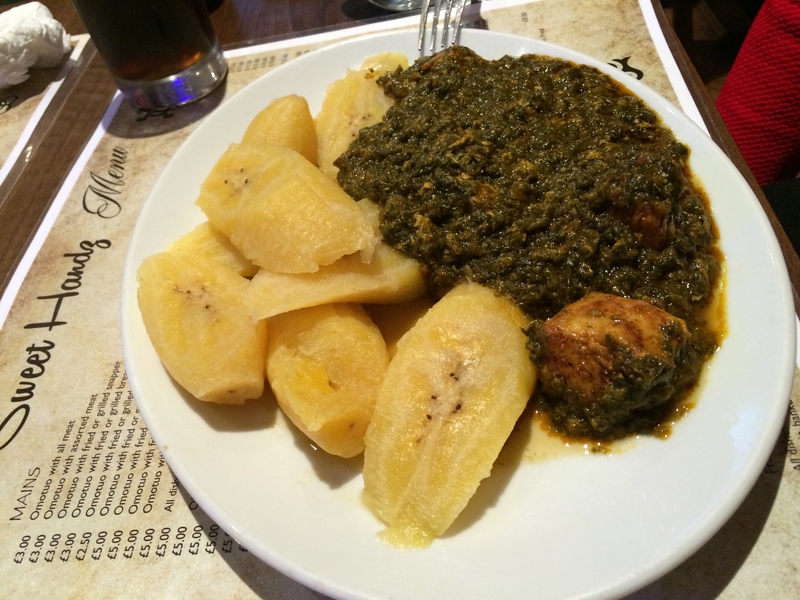 Jo fared slightly less well than me with chicken in palava (haha) sauce with plantain: she loves plantain so was delighted with the HUGE portion, but not very keen on the green palava sauce which had the slimy texture of overcooked spinach or ladysfingers, although it didn’t have an unpleasant taste. Jane, who was the only one of our quartet who had tried Ghanaian food before, chose grilled tilapia with jollof rice, which also came with salad and salad cream. Jane’s portion of rice was as huge as my own, but she didn’t manage to pile through as much of it as me. A word of warning: although the fish was very nice, don’t pick it if you are not a fan of heads and bones on your plate – this had both, and is the kind of thing that would send Andrew running for the hills! Finally onto Charlotte’s meal. I have saved the best, by which I mean the worst, for last, because Charlotte’s dinner was – I am sad to report – epically outside of her comfort zone. That’s not to say it’s the fault of Sweet Handz, as we are all sure it was authentically cooked using fresh ingredients – it was just a very bad choice by Charlotte. 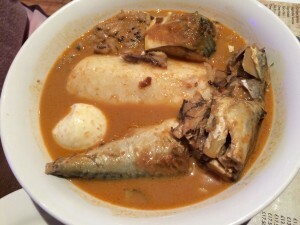 Her dish of omotuo with grilled mackerel and peanut sauce sounded great. We were told that omotuo are rice balls, which sounded like a good start. Peanut sauce made us think of a kind of peanut butter / satay sauce (okay I know this is Ghana not Asia but it’s just what came into our heads), so what we were not expecting was a huge bowl (they really do huge portions at Sweet Handz) of brown soup in which what can only be described as a log of compressed rice poking out. Definitely not the dainty ball of rice and satay sauce we were expecting! The white log was surrounded by lumps of fish (bones, eyes and skin included), and a hard boiled egg, which struck us all as rather odd and unexpected. The owner kindly offered to de-bone the fish for Charlotte and remove the head, which was lovely of her. If you have ever eaten mackerel you will know it has an intensely fishy flavour, and this flavour was all-pervading in the peanut soup, so that the only taste was of strong, strong, STRONG fish. The log of rice did not resemble rice as it was so solidly compacted, and the flavour / texture combinations were all really quite challenging for us. Charlotte did a great job of trying to eat the whole bowl, but she barely got through a third of it, and again we were embarrassed not to clear our plates considering Sweet Handz is such a nice place, run by kind and friendly people. 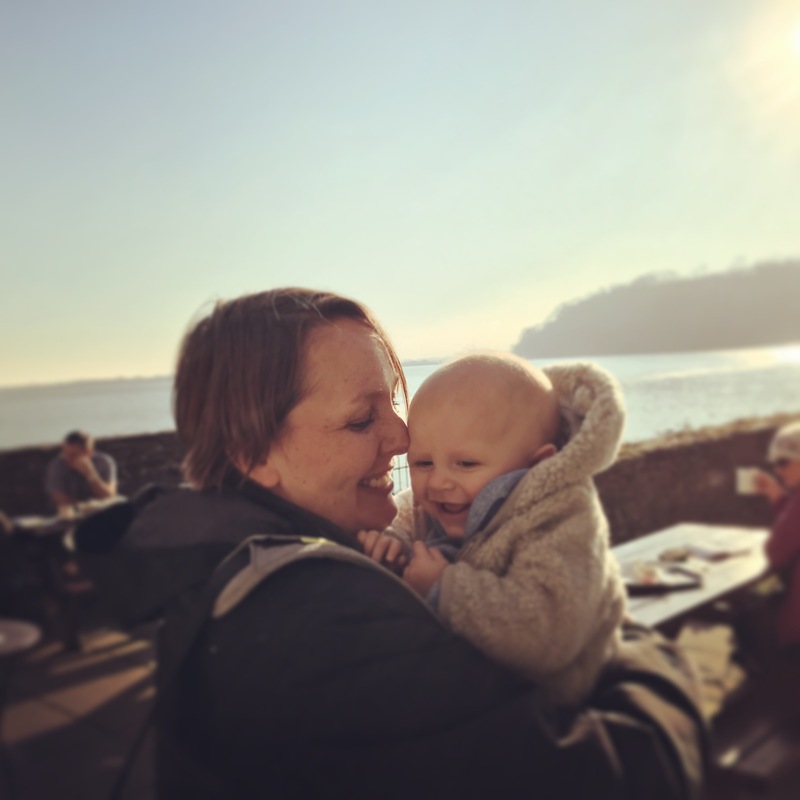 We decided against pudding (only ice cream on the menu so we didn’t miss anything traditional), and left the premises with our pockets only slightly lighter as the food prices are a bargain … and the heavier smell of mackerel on our breaths. We all said we’d go back to Sweet Handz again thanks to the warm welcome we received and the friendly atmosphere, but next time we’ll do our research and choose more wisely from the menu. Next up is H and were off to Hawaii, which I now know is not a country (it’s a state apparently), but the menu includes burgers and we’re keen on something a little less adventurous this time. 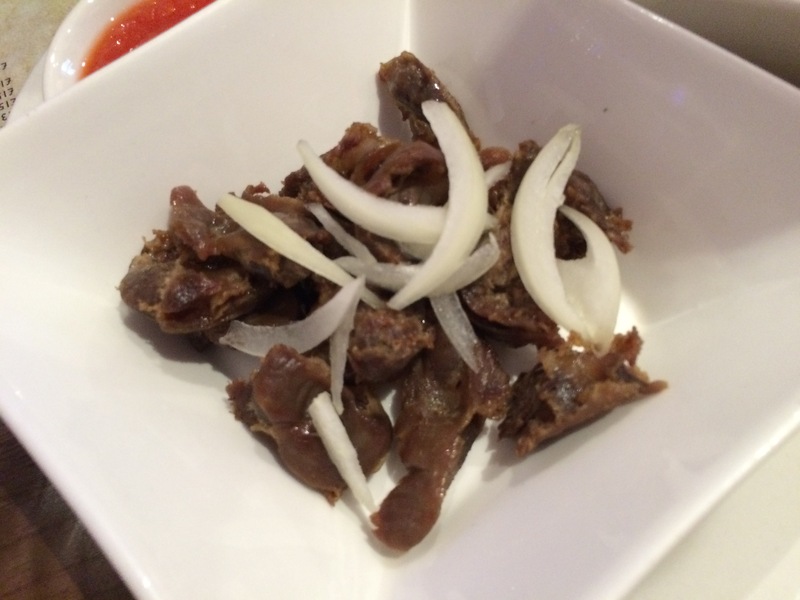 Until then, let us know in the comments below if you have any recommendations for slightly less adventurous Ghanaian dishes that we should try next time. Sorry – dosnt sound at all nice to me. Sadly some of it wasn’t, but we’ll keep trying! Sweet handz is a lovely place and the food is amazing! Your expectations shouldn’t be so high if you are not familiar with the food or the culture. I’ve attended numerous amount of times and I’m not Ghanaian but you go with an open mind. You are right – it is a lovely place and I hope the review reflects that was our point of view. I think we picked badly from the menu but will go back and try again. If you have any recommendations about what to choose then I’d be glad to hear them.